A method of using bar-codes to track the handling of material in genebanks that was developed by the International Potato center (CIP) is so useful that the kit of techniques and equipment is being adopted by other CGIAR centers to improve their daily genebank operations. 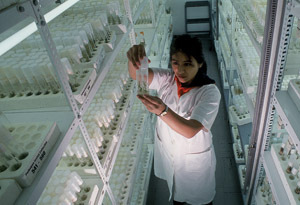 Managing genebanks involves repeatedly identifying the samples, or accessions, to track them and to update the information describing them after various processes like pathogen testing, cleaning, multiplication, characterization, evaluation, seed storage and inventory, and distribution. This process is both time-consuming and prone to human error if it is done using conventional hand registration with paper records. A group of CIP staff sought to use bar-codes as a pivotal element in improving the processes and information management in the Center’s genebank. But introducing them required several changes in the traditional systems that were used in the genebank. “CIP’s genebank manages accessions with an array of processes,” said David Tay, the Leader of CIP’s Division of Conservation and Characterization of Genetic Resources. “They include cleaning, multiplication, evaluation and conservation of samples in the field, as tubers and plants, and in seeds, cryogenic, in vitro and DNA storage. Data are recorded at each stage. The transition from hand registration to complete electronic management meant that the whole procedure in the genebank had to be analyzed to identify where bar-coding could best be applied with the highest potential cost/benefit. This assessment resulted in staff closely documenting the processes they were using and consolidating a number of databases. It also became clear that using bar-codes required several complementary hardware components, such a readers and label printers, and labels that would resist -196°C temperatures. “Once we had done all the work, we put everything into a kit,” said Reinhard Simon, CIP’s Head of Research Informatics, “Including procedures, hardware and software specifications, using cutting edge technologies that had never been brought together before.” The kit consists of six hardware components; mobile or handhelds computers, thermal printers, bar-code labels for different environments, hand barcode reader, barcode specifications and wireless access points. It also includes a technical specification document and web site, complete with links to application videos and complementary information. The kit is defined by a series of hardware specifications that give personnel in each genebank flexibility in selecting whatever equipment and consumables are available locally and engaging technical support. The kit also describes the procedures to standardize germplasm labeling and exchange information together with the best ways to use identification technologies like bar-coding. Optional components include open source software for data capture, inventory management, information integration and advice on designing and documenting workflows. To make the transfer of technology easier, the requirement to reassess genebank procedures is not an integral part of the barcode kit itself. Users are free to continue using their existing databases and software and add the bar-code kit or adapt both in case no workflows and databases are documented. “To encourage adoption we have established an on-line helpdesk,” said Simon. The processes and software that were developed for the kit contributed considerably to the relatively quick International Standards Organization (ISO) accreditation of CIP’s genebank. So other genebanks interested in ISO certification or accreditation might be interested in adopting CIP’s bar-coding kit and supporting workflows, software and databases. The concept of a kit also foresees the eventual replacement of bar-code by other identification technologies like the recently established radio frequency identification that is rapidly becoming popular in the industry. However, current cost-benefit analysis shows the unit costs are still in favor of bar-coding under genebank conditions. The emergence of a competing new technology will most probably result in further declining costs for bar-code-related tools. “From this viewpoint, integrating the bar-code kit will be a worthwhile investment for the next technology life cycle of 3-5 years as well as a facilitator to implement any new tracking or high throughput identification technology,” said Simon. Sign up now for the next Social Media Workshop! After a successful pilot online event (See blog posts about the event), the CGIAR, through its ICT-KM Program, is pleased to offer an online Social Media Workshop from May 25 to June 12 2009. “Social media is using the Internet to instantly collaborate, share information, and have a conversation about ideas, and causes we care about, powered by web based tools.” – [We Media] Social media offers a move from “push” communications towards a place where we can interact with our constituents and engage with them in ways we never could before. It enables us to network with colleagues and some stakeholders. Learn how to apply social media concepts and tools to both gather information and increase the dissemination of your information. Learn how to apply social media concepts and tools for collaboration and interaction with your organization’s staff and partners. Week 1 – Introductions, conversations and assessment of your communications needs and goals. Week 2 – Social Media Tools (wikis, blogs, twitter, file and photo sharing, and many more). You can join the exploration of a range of tools or start a new discussion on tools of your own choice. Week 3 – Social Media Tools and strategies. How these tools can help you to achieve your knowledge sharing goals. Develop your strategy. Dedicated time: A minimum of one hour per day, asynchronous (you decide when you go online), as well as two telephone conversations, one during Week 1 and the other during Week 3. Optional synchronous calls or chats may be offered if there is an interest. Platform: Moodle, Skype and/or telephone. If you choose to use a landline, you will be responsible for long-distance costs. You should have regular access to the Internet. Some tools may not be accessible for those with low bandwidths. You may need to check with your IT department, as some web-based services you wish to explore may be currently blocked in your organization and you may need to seek support to access them. Please write to Simone Staiger-Rivas (s.staiger@cgiar.org) for questions and subscription by May, 15 latest. Let’s say you have a wonder food—or anyway, a crop you’re promoting or tracking. Other than a laborious foot trek, how do you know how much of it people are really planting in a region–especially if farmers grow a complex mosaic of crops? Yes, district officers estimate acreage devoted to various items. But how good are those estimations? CIP, the International Potato Centre, promotes sweet potato for its high Vitamin A content and other nutrients. CIP wanted to know how much sweet potato was being planted by farmers in eastern Uganda. Satellite images of infrared are similar the infrared film you (or more likely your parents) may have experimented with in the ’60s or ’70s– trees and grass came out in reds and violets. Each species reflects its own “signature” colour. Using a hand-held sensor, researchers figure out what that colour is, for, say, sweet potato, as well as crops planted next to or near it, so they can differentiate them. Then they check for those colours in the satellite images. Location intelligence in the news…. The BBC Nairobi reporter David Ogot reports with interviews to our AGCommons steering committee member, Peter Ndunda, to Bioversity and CIAT’s Andy Jarvis and ICRISAT’s Pierre Sibiry. In the online publishing world, blogs seem to have taken off like wildfire. While the blog may have humble beginnings as a personal journal, it has transformed into a powerful tool for communicating online. Not too long ago, research ideas were written in closely guarded notebooks, discussed in hushed tones over coffee and within tight circles. Research collaborators across continents shared ideas via ‘snail’ mail, which may have improved penmanship but probably did not do much for research itself. The advent of the Internet and email allowed researchers and academics to learn, share and collaborate, all at a fraction of the time such activities used to take. Beyond the obvious time-saving, researchers gained from a wider network of peers. Imagine a research scientist working on maize crops or rice varieties in isolated fields in far-flung locations being able to connect with other researchers, academics and even farmers in other parts of the world – people, known or unknown to the scientist as yet. While an email exchange connects two or more known individuals, blogging takes communications to a higher level, allowing the researcher to state an idea or question or problem out to a larger landscape of researchers and networks. Within the CGIAR, researchers are already beginning to see the benefits of blogging. 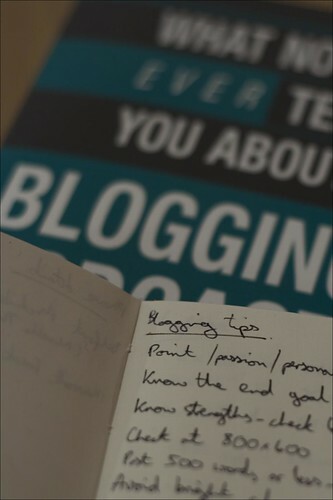 But first, for the uninitiated, what are blogs? Blogs consist of a series of regular entries displayed in reverse chronological order. They allow multiple authorship, the integration of several media in one site (photos, video, RSS feeds), and interaction with readers through comments and replies. With thousands of new blogs launched daily, the so-called blogosphere covers an infinite range of subject matters written by professionals and amateurs alike. There are several blogging software with popular ones being Blogger, Typepad and WordPress. Why should an international research organization care about blogging? A blog can help you ensure more interaction and increased visibility around your work. And this does start to sound like impact. How can a blog work to your advantage? A primary source for news. Blogs are ideal for sharing breaking news with a wide audience online; instant reporting on events and conferences. Event updates that get out to people are current and provide personal perspective. Let the human voice be heard. Interviews, reviews and commentaries are written by real people, based on first-hand experience. A well-written blog post connects with readers on a personal level, it is the blogger’s personal voice that readers ‘hear’. Project and personal information management. Blogs can double as your daily digest of activities and news. Yes, the versatility of blogs can no longer be denied – imagine a one-stop store for your photos, videos, documents and web links; your blog posts with valuable comments/ discussions. And imagine this, every entry has a permanent link and can be searched easily. Blogs can be used as the sounding board to debate and voice opinions. Blogs are an avenue for people to step away from conventional communication modes that tend to conform to organizational red tape. Blogs give you a sense of how people think and what is of value to them. Comments to controversial blog posts can be used to gauge reactions and opinions in a less intimidating setting. Blogging style dictates that authors provide abundant links to additional resources and information. This information is selected, distilled and organized to help elucidate and improve a reader’s understanding of a specific topic. When a reader comments with her own experiences, her own stories, what we have is a charming example of, dare I say…knowledge sharing. Blogging software are content management systems to all effects. You can build a fully-fledged website on this technology. A regular, constant flow of information and exchange would, in this case, be the core of your institutional presence on the web, while still allowing you to manage information that remains stable over time. More traffic = more visibility. Search engines crawl (i.e. discover and include results from) sites that are updated frequently and regularly. So in effect, every time you post to your blog, search engines will visit it, boosting your website’s search engine ranking, which is a good thing! Blogs have the power to help you foster relationships with colleagues, partners, stakeholders, donors, and the community you belong to. And relationships are the much-needed ingredient for effective impact, but only to the extent that they are managed effectively as much as in real life. I’m not sure if I agree with the last point completely, I’d say answer only if a response is needed for clarification. Your comments on this are welcome. How do we tackle ‘institutional’ blogs? If it is all about the human voice and relationships (as well as good, fresh and relevant content), how do we introduce blogging into websites that tend to have a formal, uptight feel? Readers can immediately sense the distance and lack of personal commitment that come from ‘ghost writers’ and politically-correct writers/ bloggers who use blogs as a channel to give out information that can already be found in websites and newsletters. Interaction not required! Then, why use blogs? Blogs have great potential not only to inform but also to challenge perceptions. They can be used to draw out different points of view, commentaries, personal experiences and even, support for your blog post. The blog as a tool empowers people and helps create change. If leadership wants transparency, in social media, they are going to have to take some personal risks because….people pick up on the ghost writing, the lack of an authentic voice. She questions if they are realistically willing to blog, to be vulnerable and yet confident in their position and voice. Personally, I started my first blog post in 2005. It was a harrowing experience filled with fear – that my words would represent my stand on a topic or on life itself, that all and sundry would read it and hold me accountable. In short, I was not ready to share my thoughts so I quit with just that one post sitting anonymously in the blogosphere. Until early this year, that is, when I realised that blogging was a great way to share new perspectives and gather feedback. I could post a blog about a particular topic and share it with a wide group of friends and colleagues – mass outreach in a fraction of the time it would normally take if I were to talk to different groups separately. Encourage frequent, short updates that aim to keep in touch. This ties in with Simone’s list for effective management of blogs. The list grows daily (if you know of any other interesting blogs, tell us here in the comments). So, check them out. I’m going to subscribe to them via RSS feeds… but that’s another blog post! Embracing Change: where is the CGIAR in its reform process? In December 2008 the CGIAR decided to change its governance structure and way of doing business to better serve a world that is changing fast in financial, social, climatic and environmental terms. Four months into the implementation phase, is the CGIAR change process on track? Building momentum? Gaining traction? The second second edition of Embracing Change gets to the heart of the matter with an interview with the Transition Management Team (TMT). Also….In March, communications experts from CGIAR Centers gathered in Penang for a Strategic Communications Workshop to strengthen collaborative communications across the CGIAR. Change communications was on the agenda, and the event coincided with the TMT meeting and provided an opportunity for engagement between the two groups. Read the article on our blog to get a taste of the lively exchange.